Hillary Clinton unveiled two proposals meant to expand voting across the country while lambasting her Republican counterparts for passing laws that she said were aimed at restricting the voting rights of minorities and young people. "We have a responsibility to say clearly and directly what's really going on," Clinton said in a speech at the Texas Southern University in Houston, a historically black college. "What is happening is a sweeping effort to disempower and disenfranchise people of color, poor people and young people from one end of our country to the other." She attacked four current and former Republican governors by name, saying each had signed laws or taken steps to make it harder for minorities and young people to vote. Texas Gov. Rick Perry - who entered the presidential race Thursday - signed a law that a federal court said was written to discriminate against minority voters and applauded the 2013 Supreme Court ruling that gutted portions of the Voting Rights Act, Clinton said. She criticized Wisconsin Gov. Scott Walker for cutting back early voting and signing legislation making it harder for college students to vote, and New Jersey Gov. Chris Christie for vetoed legislation to extend early voting; and said that state officials oversaw a "deeply flawed purge of voters" ahead of the 2000 election when Jeb Bush was serving as Florida governor. Bush is set to declare his presidential candidacy on June 15 and both Walker and Christie are pondering their own 2016 bids. "Today, Republicans are systematically and deliberately trying to stop millions of American citizens from voting. What part of democracy are they afraid of?" Clinton said. "I call on Republicans at all levels of government with all manner of ambition to stop fear mongering about a phantom epidemic of election fraud and start explaining why they're so scared of letting citizens have their say." In addition to calling on Congress to restore portions of the Voting Rights Act, she said the U.S. should implement bipartisan recommendations to shorten voting lines. She also unveiled two of her own initiatives, backing a broad expansion of early in-person voting and the implementation of automatic voter registration. Clinton wants every state to offer no fewer than 20 days of in-person early voting, including opportunities to vote on evenings and weekends. Such a change, she said, would reduce long lines on Election Day and give more Americans the chance to cast a ballot. "If families coming out of church on Sunday are inspired to go vote they should be free to do just that," she said. She also noted early voting is more secure, more reliable and cheaper than absentee voting. Thirty-three states and Washington, D.C. currently offer in-person early voting or allow voters to apply in person for an absentee ballot and cast that ballot in one trip to an election official's office, according to the National Conference of State Legislatures. Clinton's other major initiative is universal, automatic voter registration for every citizen on his or her eighteenth birthday, unless the citizen actively opted out. Her campaign says that between a quarter and a third of citizens are not registered to vote. The proposal, she said, would have a "profound impact" on American elections and democracy. Maximizing voter turnout will be important for Clinton, who must get the votes of both young people and voters of color to win critical swing states and replicate President Obama's victories in 2008 and 2012. Young people tend to be registered at lower rates than their elders: In 2012, a full 25 percent of voters between ages 18 and 29 were not registered to vote, compared to just 10 percent of those older than 60, according to U.S. census data. The same data shows that 26 percent of Hispanic voters were not registered to vote, compared to 14 percent of white non-Hispanic voters and 11 percent of black voters. 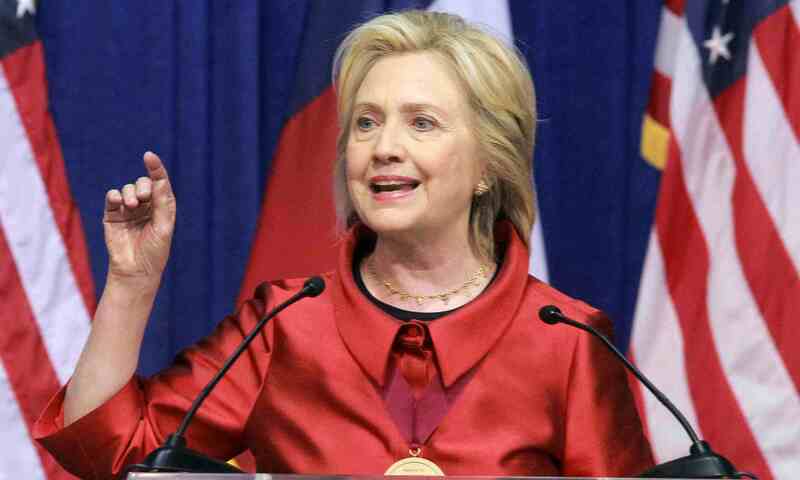 Before her speech, Clinton received the Barbara Jordan Public-Private Leadership Award from Texas Southern University.